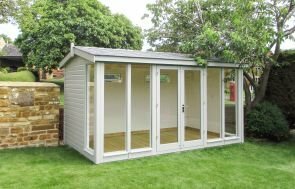 This modern 2.4 x 3.0m Salthouse Studio has recently been installed in Peterborough, Cambridgeshire and is to be used as a cosy outside space for our customer to enjoy their garden from. 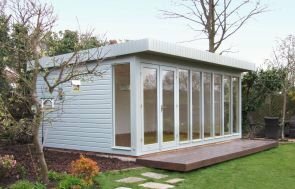 As with all of our garden buildings, our Garden Studios & Offices are fully customisable to your exact requirements and benefit from free delivery and installation by our expert team, as part of our end to end service. This particular model has been painted with ‘Pebble’ from our Valtti paint collection, which is a nice, neutral colour that suits the customer’s garden. Valtti paint uses the 4 coat system, which is proven to be the best possible protection for exterior timber, meaning that it achieves a very low maintenance, durable finish. 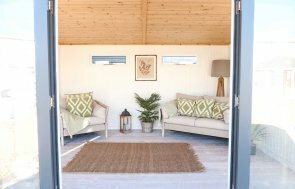 If you would like to find out more about our , Sheds, Summerhouses and Garden Rooms, please request a callback from our team, Contact Us or call us on 01760 444229 to discuss the options available.